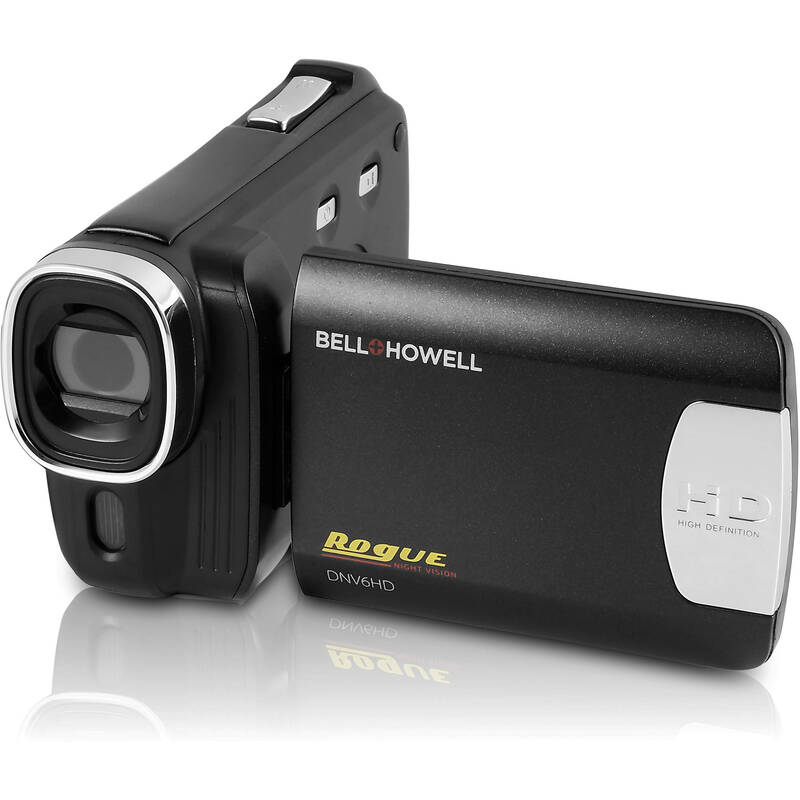 Combining a slim body design, with a flip-out three inch LCD touchscreen the black Rogue DNV6HD 1080p HD Night Vision Camera from Bell & Howell records HD video in 1080 and 720p as well as SD Video, is compatible with NTSC video standards, and captures 20MP still photographs. It features a 5MP CMOS sensor, and incorporates a fixed 7.5mm lens, with digital 8x zoom to bring you closer to your subject. The camera shoots color images in normal lighting conditions, and it has built-in IR illumination for dim or dark conditions. The camera features electronic image stabilization, and a choice of nineteen built-in shooting modes. The three inch LCD touchscreen allows you to see what is going on, and control the camera via its menu. The camcorder records using M-JPEG compression to optional SDHC cards, supporting media cards up to 32GB. The camera incorporates IR LED illumination for night vision shooting, in black and white. Box Dimensions (LxWxH) 9.1 x 6.6 x 2.75"
Rogue DNV6HD 1080p HD Night Vision Camera with Touch Screen (Black) is rated 1.5 out of 5 by 2. Rated 2 out of 5 by Admiral_Colossus from Not Great but cheap I only bought this for the night vision mode.It shoots out infrared light as part of the night vision capability. If you were able to find like a infrared flashlight or something like that it might make the nightvision better.Not bad for $.Make sure to shoot at 720 as opposed to 1080, because 1080 is only at 15fps. Rated 1 out of 5 by Majken from A little disappointed I purchased this camera for actual night-vision video recording. The actual Night-vision recording does not work as expected. when taking still photos it works as it should, but when recording video night-vision does not detect as well as the still image camera. It does really well when taking night vision-photos, but recording in night-vision is obsolete. Is there a way to turn off the LCD screen display? The only way known to shut off the screen is to close it against the body. How far can one see with this camera's IR (under total darkness)? I haven't use it in total darkness. I use it for my daughter play rehearsal where the lights wereturned off. I didn't really like the quality of the pictures. I actually stopped recording and use my Galaxy note 3 to record the play. Even my wife said the picture quality was better on the phone than the camera. I use it during the daytime it works better. Can this camera be attached to a tripod? Does this camera come with a hand strap? I do not remember getting one,but I prefer to purchase padded straps, as I have small hands, and the padded straps have proved more reliable for me. Is there a way to do long (several hour) recordings continuously? It stopped recording and turned off by itself after about 90 minutes, even though there was plenty of battery life and memory. This is a fail-safe feature built into the device to prevent overheating of the processor. Is this camera have a good sound recording under loud conditions (Rock Band). Not distorted? The built-in microphone is designed for average recording conditions. I'm afraid that the sound levels encountered at a live rock venue would cause over-modulation distortion due to the very high SPL. About 1 hour of continuous recording time. Does this camera have a rechargeable battery? Yes, the included battery is a rechargeable lithium ion type. The battery charger is included as well.